There are four (4) small thumb screws that hold the back side panel on. There is also an included dust filter for the optional fan spot. The four (4) thumbscrews on the back panel can be replaced with feet and screws, to have the case in a desktop style orientation. There are two (2) keyholes for hanging the chassis on the wall, should you choose. There is (mostly) 35mm of space between the motherboard tray and the back side panel; enough space to comfortably run wires. The top panel section is removable by removing four (4) screws. The PC-O5s came preinstalled with a pair of 120mm fans in the top. There are six (6) screws that hold the fan mount to the top panel. There is also a removable dust filter that covers the 120mm fans. The frame of the dust filter is metal, and quite sturdy. Looks like a pretty cool case. Thanks for your time on this review. Nice review Mos. 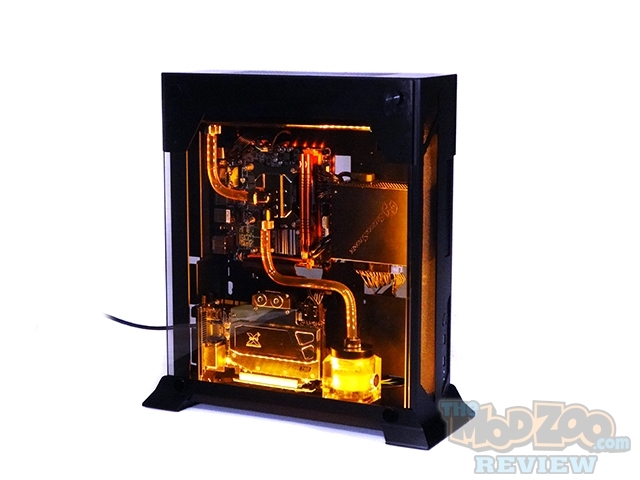 This case seems like a clear effort from Lian Li to offer something in the realm of InWin’s higher end concept cases. These cases looked amazing when we saw them at CES. Some people will balk at the price tag but this is a high caliber case that looks incredible. 90% of the people that walked by on the show floor stopped to look at them when we were at the booth. 1) It can only accommodate a 190mm GPU out of the box. 2) It’s price tage in the UK – £280 ($417 US) erm sorry but no chance would I or many others pay that.